After studying 3D design at York College of Further & Higher Education I went on to run my own pottery studio and gallery in Robin Hoods Bay, North Yorkshire and have subsequently worked in schools, colleges and specialist care settings for over 15 years, teaching and inspiring students of all abilities and ages to “have a go”. 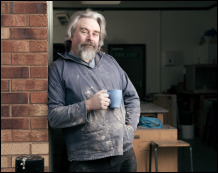 Situated in Holme-on-Spalding Moor, East Yorkshire, The Potter Man Studio is a fully equipped and dedicated ceramics studio extending to 1200sqft. There are 6 wheels, 2 kilns plus a selection of different clays and glazes available for students to use and free car parking on site. If you need to take a break from your artistic endeavours, there is a separate coffee room with an expanding library of reference material, books and journals. The studio is partly Arts Council/Creative Industry Finance funded and provides a relaxed, creative environment and educational resource.